January 26, 2012 will be extra special for me this year; my first Australia Day as an Australian Citizen, having been naturalised in September at the Brisbane Convention Centre. There are many ways to celebrate Australia Day; with family or friends, at a barbecue or beach, or at one of the many celebratory events in and around Brisbane. The Australia Day Festival and AusSounds Concert, at South Bank Parklands, is a free, family festival. The day begins at 10am with a Multi-Faith Ceremony, followed by a Flag Raising Ceremony, an F/A-18F Super Hornet flypast, and a traditional 21-gun salute at noon. Entertainment includes extreme ski shows on the Brisbane River, classic Holden car displays, and Young Designer Markets. The evening's entertainment begins at 5 pm with the AusSounds Concert featuring Brisbane's pop rock band Adventure Land, Triple M's live Guinness World Record attempt, Network Ten's Young Talent Time Team and Rob Mills performing acts from their new show (airing in 2012), and Christina Parie (X Factor 2011). The festivities finish with a fantastic fireworks display at 7:30pm. For more information, click here. Aussie Arvo is another free festival celebrating all things Australian. Located at Pine Rivers Park in Strathpine, this fun day begins at 3pm and concludes at 7:55pm with a spectacular fireworks display. The Kid Zone will feature a giant sand pit, backyard games, lamington eating contest, and an animal farm. Other entertainment includes an Aussie ute display, market stalls, and $2 amusement rides, including dodgem cars, tarantula, giant water slide, and more. The Moorooka Lions will hold a Citizenship Ceremony and Community Awards as part of their Family Fun Fair. The fair, at Pegg's Park on Koala Road in Moorooka, will run from 8am until 1pm. As well as food and drink stalls, the fair will feature free rides: a merry-go-round, ferris wheel, and jumping castle. Entertainment includes live bands, a reptile show, and an animal farm. The fun continues with free fairy floss, face painting, and pony rides. Visit the Lions website for more information. Fish, Fun, and Aussie Sun is a free, family-friendly day out at the beach. Kids will be entertained with beach and water games, art and craft workshops, and an ice-cream eating competition. Parents can enjoy the DJ music, mud crab races, and butcher's cook off. Fish, Fun, and Aussie Sun will take place from 10am until 4pm at Sutton's Beach on Marine Parade in Redcliffe. For more information, click here. The Aussie Beach Party on Bribie Island is yet another free, family fun day at the beach. Read this review for more details. Still on Bribie Island, The Bribie Island Hotel will host an Australia Day Family BBQ beginning at 3 pm. Activities include 'toad races', sack races, and fun games while kids will be kept amused with face painting and a clown. Visit The Bribie Island Hotel website for more information. 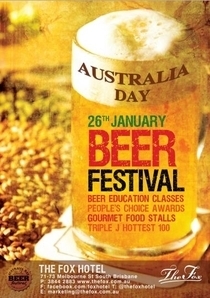 The inaugural Australia Day Beer Festival at The Fox is "not just for beer enthusiasts, but rather the beer curious". The Fox Hotel (South Brisbane) is promoting this festival to provide the Australian craft beer industry with the recognition it deserves. Highlights include People's Choice Awards, beer education classes, gourmet food stalls, and Triple J's Hottest 100. The Story Bridge Hotel (Kangaroo Point) will hold it's 30th annual cockroach race. 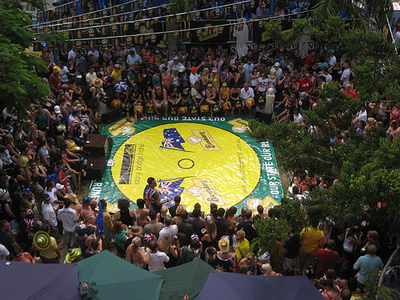 The cocky races, a fun and unusual way to celebrate Australia Day, are incredibly popular with up to 7,000 punters taking part throughout the day. The first race begins at noon (doors open at 11am) with fourteen races run between then and 4:30pm. Contestants are encouraged to train and bring their own cockroach but the creepy crawlies can also be purchased for $5 from the house stable. Additional entertainment includes live music, a dunk tank, and the Miss Cocky Competition. All proceeds from entry, racing, and dunk tank will be donated to Variety, The Children's Charity. Click here for more details.